When Jamie Church Taylor (BS ’03) shopped for aprons for her mother and mother-in-law in 2007, all she could find were the “boxy, old-fashioned, and grandmotherly” variety. Since she considered both women to be trendy and contemporary, she opted to design and make the aprons herself. Little did the Provo resident realize her aprons soon would provide a livelihood for two families. Noting a lack of fashionable apron options in stores, Heather Hansen (left), Jamie Taylor (right), and their husbands ventured into the business world and found success. Each came to the first meeting with 10 ideas. Jamie suggested designer aprons, and the group jumped on the idea, thinking they could be created with relatively little initial capital and would generate money fairly quickly. 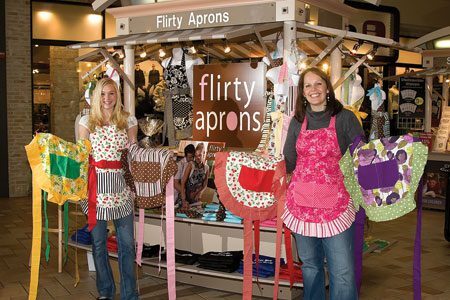 They launched Flirty Aprons with the idea of generating some income and undertaking a more momentous business later. “It didn’t take us long to realize the aprons were going to be the significant venture,” Spencer says. They started with eight apron designs, found a manufacturer in Provo to produce them, and began with an initial order of 500. They sold within a month. They opened their first Flirty Aprons store a year ago in the University Mall in Orem, Utah. “We had a two-day lag, and then the aprons really took off,” Joseph says. Their products are offered in other Utah malls and sold throughout the country from their Web site. The partners have also begun franchising their business in the West. Each partner is a chief: Joseph is the chief executive officer, Heather the chief marketing officer, Jamie the chief operating officer, and Spencer the chief financial officer. When asked how they make it work with four leaders, Heather explains, “We are all rational, logical people who want to make the business successful. We communicate really well together, and we all work equally hard in the business.” While they see each other several times a week, they also have a weekly board meeting to make sure their objectives are aligned. The women, especially, have distinct ideas about how the aprons are branded. None of the partners was a business major—their bachelor’s degrees are in economics; psychology; exercise science; and marriage, family, and human development—but they have made extensive use of mentors through the Center for Economic Development and the Small Business Development Center, both in Orem.